A great TV show is only as good as its executive producer. Whatever the vision, it’s shaped by a creative and fiercely strong mind that can anticipate problems and avoid them—sometimes by mass firings. Norman Lear was All in the Family‘s strong mind, while Chris Carter was The X-Files‘ grand conspirator. What we’ve been observing over at The Walking Dead is a three-ring battle between three very fiercely strong minds, each one cited as an executive producer. Frank Darabont was the man primarily responsible for developing the comic book mythology into a series, and brought along his trademarked stoicism and otherworldly perspective to a familiar genre. It wasn’t long before Darabont fired the show’s writing staff, including another executive producer, and opened the show up to freelance ideas. By summer 2011, Darabont had stepped down as the primary showrunner (or allegedly was asked to step down according to The Hollywood Reporter), and it was time for Glen Mazzara to take charge. New writers joined the series, as Mazzara reshaped the series into survivalist mayhem, boosting the unpredictability factor. You don’t have to be a Hollywood insider to see where much of this leadership shakeup is coming from (and isn’t that fitting, since it’s partly a show about dueling leaders? )–Robert Kirkman, the original writer and visionary behind the successful comic book. Over at the Hollywood Reporter, it’s suggested that Kirkman flexed his muscle, pressuring AMC to choose him over Mazzara, assuming that the story’s creator is best qualified to keep the fan base happy. Scott Gimple, often perceived as Mazzara’s second-in-command, will take up the reins next season. What does this mean creatively speaking? 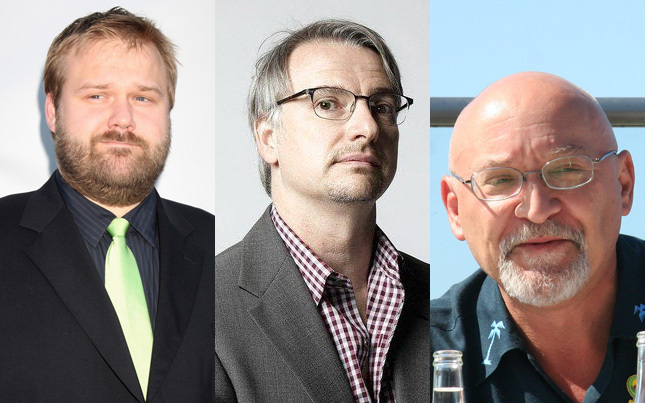 It’s hard to speculate, although most wouldn’t argue with this basic overview of each producer: Darabont established the vision, Mazzara kept things twisting (and kept people dying), and presumably Gimple and Kirkman will keep the show closer in line with comic book continuity. What do you think? Will season 4 of The Walking Dead go in a different direction? I agree I thought season 2 dragged out…but then again, I don’t want them to speed through the series. I would love it go 10 seasons. Yeah they are moving way too fast at the prison. They said it was going to last 2 seasons. I know they didn’t want what happened in season 2 to happen this season but damn, SLOW DOWN! Season 2 had a close to perfect balance for me. I think if they had waited slightly longer for a certain event in the premiere to happen and slightly condensed other parts it would have worked. Season 3 is a better balance for me. I still love both. Gimple has written some very good episodes. I have faith for him.